Chestnut-tressed triple-threat Lauren Cregor blew in breezily from New York to land, ever so sweetly, onstage at The Cabaret at The Columbia Club Friday evening. 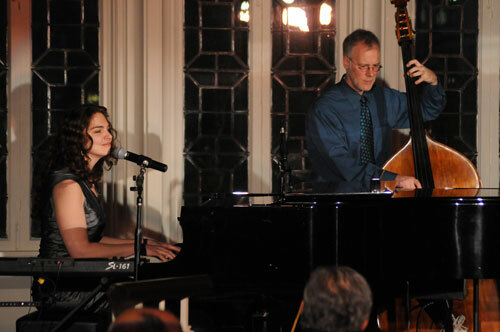 The singer-songwriter, pianist and composer returned home for a heartwarming engagement in the glow of her family and friends' admiration and love. Starting the show with the sassy, smart Let's Not Be Friends, Cregor scooped up the members of the audience and kept them in the pocket over her heart the entire evening. Second selection The Lover was a stop-and-start whimsical number giving a glimpse into the creative brilliance that is Lauren Cregor. 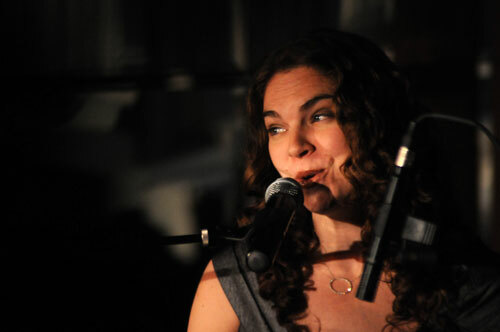 Playing Indianapolis was a reunion for Cregor, graduate of Cathedral High School and Indiana University. Surrounded by friends, family, including her grandmother, the feisty, Italian-infused songbird opened her warmth to the crowd, winning their attention, applause and loyalty. Marina, written about, and sung to her 92-year-old grandmother, sitting at the table next to this critic, stopped time in the Columbia Club. One of those goose bump, surreal moments which come along all too rarely. Not one glass clinked, no silver dropped, as we all watched and listened with rapt attention to every syllable and chord rejoicing the love for her cherished grandmother. From the first words, I'm going home...to the last, I'll always stay...Cregor enveloped us and took us on a journey of innocence and lullabies…a magic carpet ride of deep-rooted respect, love and happiness. We didn't want to land...and we didn't. The well-deserved standing ovation didn't end the warm feelings among the audience members. Lingering in the Crystal Terrace afterward to meet the lovely singer, well-wishers spoke of her great talent and great love of life. 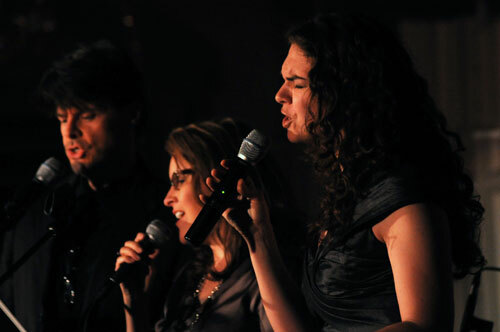 Shannon Forsell, The Cabaret director, and powerful singer in her own right, joined the Indiana native onstage more than once, re-enforcing that her own talent can be enjoyed solo or as a trio. Third of the trio was local talent Dave Ruark. 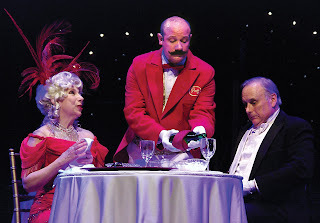 Known most-notably for his comedic brilliance at Comedysportz, Ruark also wows audiences at the American Cabaret Theatre, The Civic Theatre and The Phoenix Theatre as a dramatic actor and singer. 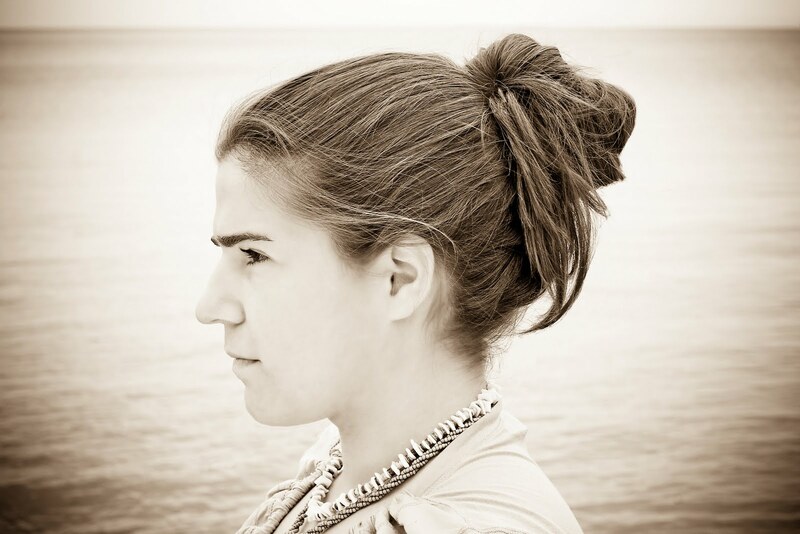 Bottom Line: Lauren Cregor makes time stand still with her lyrics, powerful vocals and sincere warmth which originates from somewhere deep within her soul and familial roots. If you have a performance or event you would like reviewed, e-mail me at Elizabeth@gottago.us. 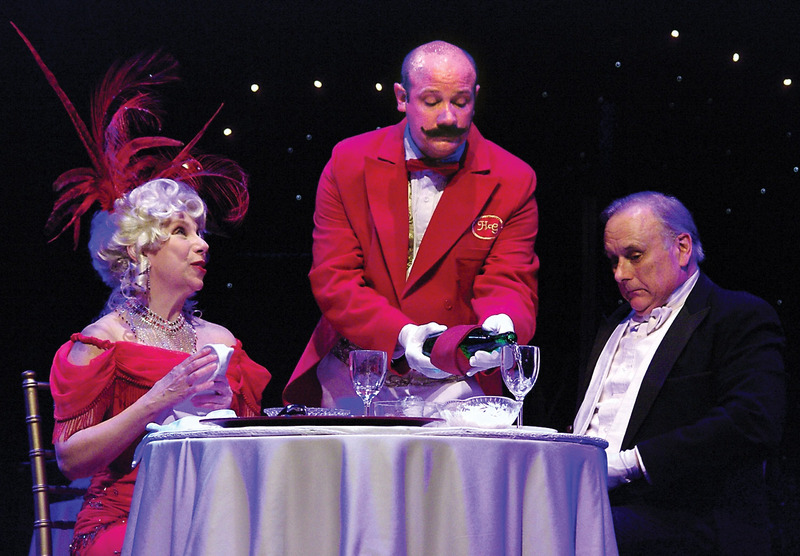 Me, I’ll be right here, enjoying one last flute of champagne…what’s cabaret without the bubbly? 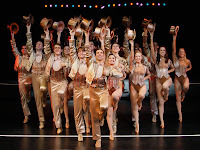 Broadway Across America's A Chorus Line, played at Clowes Memorial Hall, proves the strong storyline which is as rele vant today as it did at its inception in 1975. 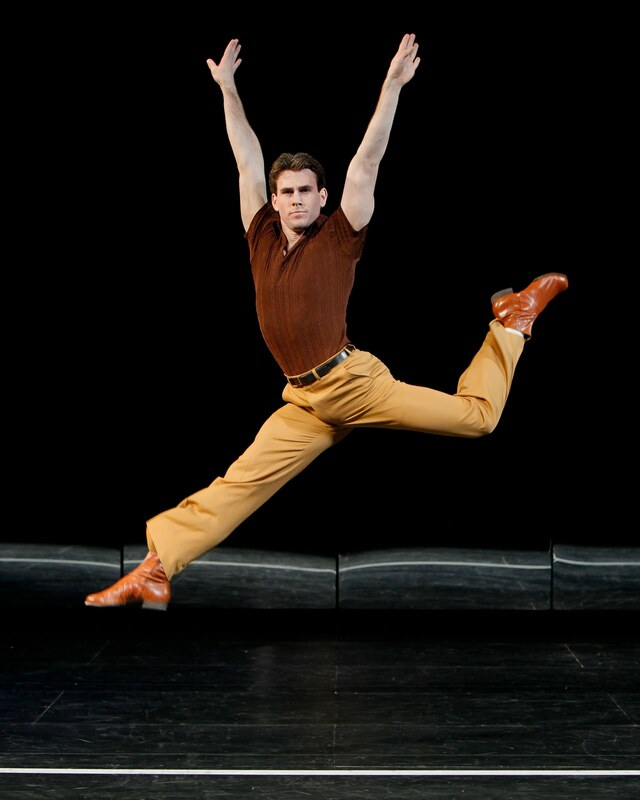 When dancers arrive to a 'cattle call' for a Broadway show, they are asked to reveal more of themselves than dance moves. Several stories are brought forth during the day-long process. Selina Verastigui played the role of Diana, turning in the sobering solo Nothing, the tale of a young girl mis- treated by an uncaring teacher in performing arts school. 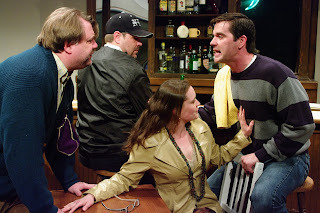 Derek Hanson portrayed superbly the role of Zach, the show's director, a Type-A personality with an internal struggle when Cassie, played by Rebecca Riker, the woman who broke his heart, turns up for try outs. Zack's need to know why Cassie left him and his need for her to remain the star he had created is intertwined with his need to punish her for the pain he ensued when she shattered his dreams. Other story lines include the fun solo, I Can Do That, by Andy Mills in his portrayal as Mike upon learning he preferred dance c lass over sports. The crowd-pleasing, Dance: Ten; Looks: Three, was offered by the delightful Kristen Martin as the plastic-surgery-needing Val. Martin so thoroughly enjoyed her role, her enthusiasm was contagious. 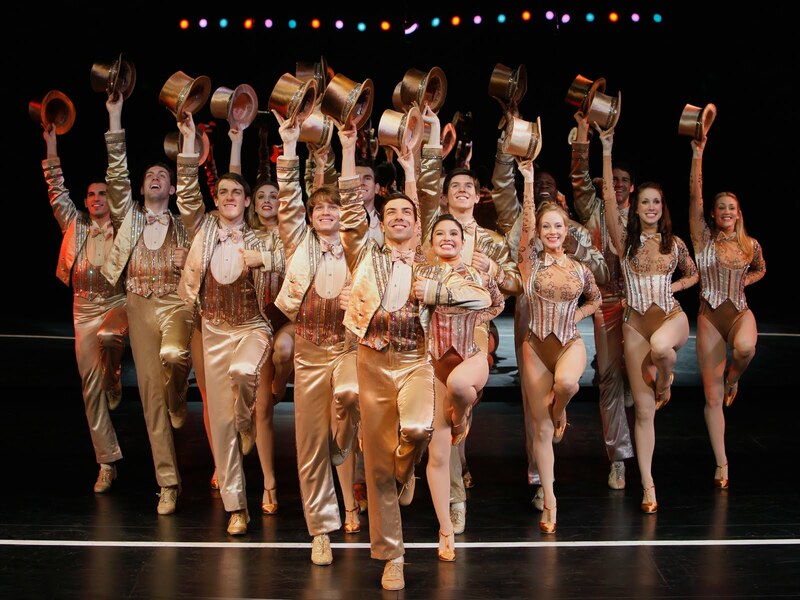 Bottom Line: A Chorus Line continues to share with the non-dancer why dancers need to dance over everything else and gives a glimpse into the struggles and passion of performing artists. If you have an event or performance you would like reviewed, send an e-mail to elizabeth@gottago.us. Being asked to review musical talent is always a pleasure. Alas, I do not have enough column space to write about all the CDs sent me. However, coming to The Rathskeller April 29 is a new musical obsession of mine I would like you to get to know. If a miracle had occurred and a love child was created by Joni Mitchell, a sober Janis Joplin and fellow-Chicagoan Rikki Lee Jones, her name would be Daphne Willis. 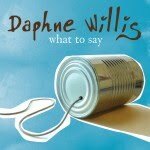 Willis has released What to Say through Vanguard Records. Producing a folksy/ bluesy/Car ibbean sound, I was surprised to find this was Willis’ debut album. The singer-songwriter has a laid-back smooth sound which lends itself to either great background music or listen-to-and-discuss music, depending on the track chosen and the mood you’re in at the moment. The listener is tricked into believing they are hearing a world-weary older singer when in truth Willis is a fresh-faced twenty-something with a positive, enthusiastic approach to life. Perhaps Willis is an old spirit in a college student’s physical form; however, she delivers the veteran-style goods especially with Everybody Else, Love and Hate and slowed-down Pulled Tight. I sat down with Willis while she was performing in town recently and was impressed by her professionalism and quality of live sound. Plucked from anonymity in an unusual way, Willis’ talent was discovered by Welk Music Group president Kevin Welk during a flight as he listened to American Airlines’ piped-in music. This proved to be a lucky break for her and us. Bottom Line: You’re best bet is to catch this remarkable talent right away so you can keep track of her almost certain journey to becoming a household name. The difference between art and entertainment, according to my former professor of theater appreciation, is that art broadens your thinking, entertainment merely amuses you. Others have likened it to the difference between healthy and junk foods. I believe both are correct and would like to state that sometimes a spoonful of sugar truly does help the medicine go down. Mine comes in the form of Jessica's Magic Cookie Bars at The Phoenix Theatre's snack bar. Purchasing a couple of her baked goods is an absolute must for every one attending a performance at Indy's off-Broadway theater. Hey, we all support the arts however we are able, and the proceeds benefit the theater. Yankee Tavern, another Stephen Dietz play, opened at Phoenix, 749 N. Park Avenue. You will remember my fondness for IRT's version of Dietz' Becky's New Car. 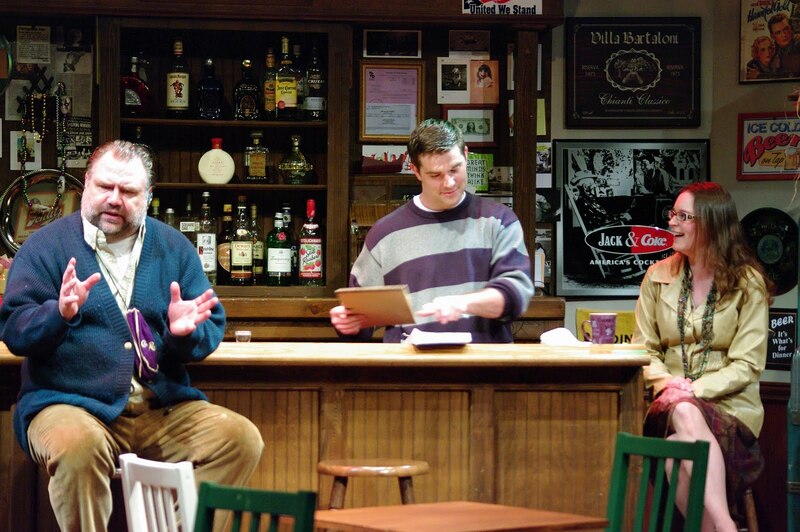 This piece is set in a NYC tavern near Ground Zero, post 9/11. Bar regular Ray, who is depressed and lives in the abandoned upstairs, is portrayed by Stephen Hunt, and is the over-the-top-everything-is-a-conspiracy personality. 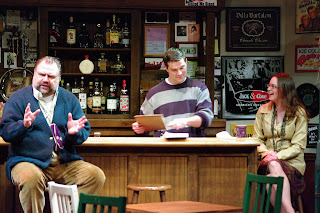 The tavern’s owner is graduate-student Adam, played by Shane Chuvalas. Chuvalis comes into his own strengths in this play, giving a solid performa nce as the guy who has secrets of his own, as well as demons to deal with concerning his father's death. Hunt turns in a superior performance as the emotional conspiracy zealot. The interpersonal exchanges between Chuvalas and Hunt are, by far, the best quality in this show, with these two actors keeping the flow of the show zipping along. Dietz' speedy dialogues are part of his gift and finding actors able to keep up the pace is a big plus. A bothersome point is when Ray, who up to this point believes all conspiracy theories, doesn't believe Palmer, played by Doug Johnson, when he offers a hard-to-believe theory. It’s a little out of character and rather noticeable, at least to me. The extra story lines, Adam's father, the wedding plans, and a couple of others, tends to misdirect the focus and muddies up what could have been an exciting ride. The thr ill and momentum is lost a little when an affair is brought into the mix and ghosts of the tavern are discussed. However, the ins and outs are less important than the final message in this work. It brought up excellent points and caused one to reconsider a few others. Bottom Line: Yankee Tavern should be seen so as to create a need for answers in each of us and to reopen questions we asked ourselves on 9/11 and immediately afterward, but left unanswered and forgotten. Looking ahead: I will be attending the 17th Annual Stutz Artists Open House Friday and Saturday, 1060 N. Capitol Avenue. If you have an event, performance or restaurant you would like reviewed, please send an e-mail to elizabeth@gottago.us. Me, I'll be right here, thinking about my favorite conspiracies. Hello Dolly, like a favorite pair of well-worn jeans, or a comfort food, gives you the warm fuzzies and bring back great memories. Now playing at Beef and Boards, 9301 N. Michigan Road, it reminds me of all the musical classics I have enjoyed over the years, the fun, frivolity and, of course, singing and dancing. 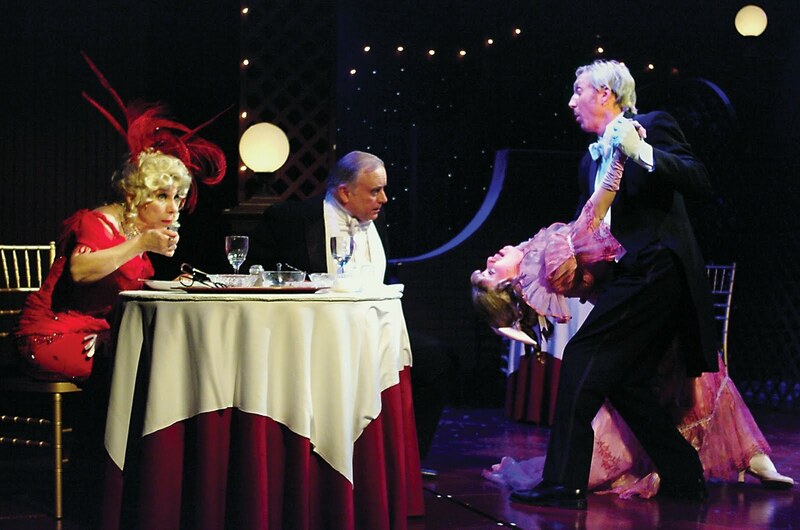 When Dolly Levi, portrayed by Iris Lieberman, sets her sights, and matchmaking skills, on wealthy widower Horace Vandergelder, played by Mark Goetzinger, the hilarity ensues. Lieberman and Goetzinger are well matched, especially during the fast-paced restaurant Harmonia, scenes. Their rapid-fire interaction, ripe with frustration on tight-fisted Vandergelder's part and full of doubletalk on Levi's side, are the best parts of the show. Having included in the cast two of my favorite Indy actors, made this show even more enjoyable. Goetzinger, A Christmas Carol, Treasure Island, is a solid, subtle, quiet talent showcasing his vocals impressively with It Takes a Woman, and So Long Dearie. I was impressed by Goetzinger the first time I caught him, at IRT, opposite another of my Indy favorites, Charles Goad in The Fantasticks. I make a point of seeing any show he is in, making him a "Destination Actor." 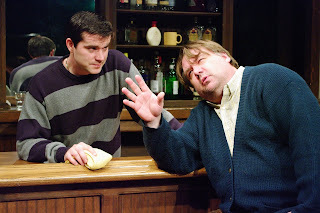 John Vessels, whom I have crowed about since I first encountered him in B&B's Smoke on the Mountain trilogy, is truly a treasure for the audience and the theater. Never out of character, Vessels gives every ounce of marvelous ability he can, and brought delicious energy to the various roles he portrayed, including Judge and waiters' captain, Rudolph. He is also a "Destination Actor." What is that, you ask? It's a term I use to describe the actors that we, as theater and movie attendees, search for in a casting list. When we see they are in a particular show, we make a point of going to see it; they are our destination. We benefit from their performance and the actor directly influences positively to the show's bottom line. Everyone is a winner. Beef and Boards is celebrating 30 successful years under the guidance of owner, Doug Stark. 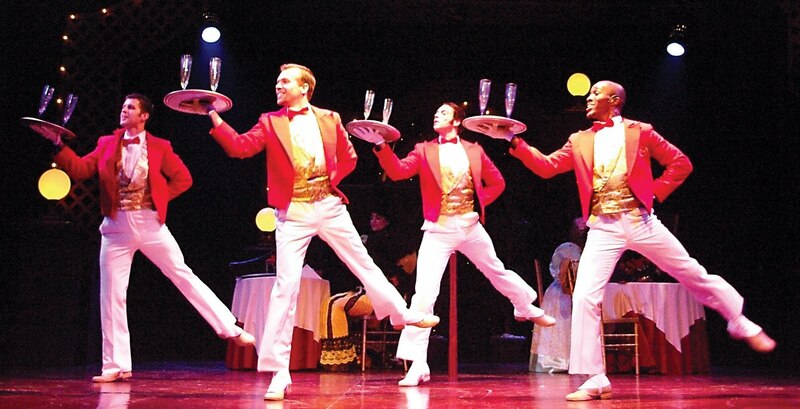 Hello Dolly proves Stark knows exactly what his audience wants. You can now catch me weekly at 6:56 a.m. and 8:56 a.m. on 93 WIBC's Saturday Morning News Show, giving a quick Gotta Go list of things to do in the Indy area, including restaurants, events, theater and films. If you have an event you would like reviewed, send an e-mail to elizabeth@gottago.us. Me, I'll be right here, remembering It Only Takes a Moment.